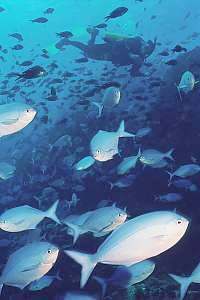 This section gives diving information for the Kermadec Islands, the jewel in the crown of New Zealand's marine reserves. Not many divers will be able to do so, due to the amount of effort to get there, cost and exposure to the elements. The trip by boat takes up most of the time, which leaves precious little for diving. But on the way, already at Esperance Rock, one can make the first dive, followed by Curtis and Macauley. Best diving is done around Raoul, which also provides shelter from waves and wind. For corrections, suggestions and improvements, e-mail me. I am most interested to include more dive spots and experiences of others here. Although located only 1000km (Raoul) NE from Auckland in New Zealand, the Kermadec Islands are difficult to reach. An expedition of two weeks may give only 3 days of diving. One day is well spent visiting Raoul, which can be arranged by VHF radio channel 16 [see box]. Raoul has a 'permanent' Department of Conservation staff of four, who do a full year's service, and more volunteers for about 8 months a year. Here one can experience the work of conservation volunteers, their enthusiasm, hospitality and determination, from nearby. As you are aware all the Kermadec group are now pest free. As a result of this status we are keen to increase the biosecurity provisions to ensure that this status is maintained. In achieve this we would like to ensure that all yachties departing for Raoul with the intention of stopping off should obtain permits prior to leaving NZ. This will enable us to ensure that boats are rodent free and alert our staff on the island of likely arrival times so that they can ensure that rat bait stations and traps are set in advance. It may also be worth noting in your web site that all boaties who intend even stopping off even without landing should make sure that their boats contain rat prevention measures as even anchoring close to the islands can pose a risk. Direct dial 09 4257243 Mobile 027 4910708 Please note that the information in this box is subject to change. Contact DoC direct. The voyage of 1000km takes most boats 4-5 days each way, but once within the Kermadec Group, dives can be planned along the way, off the islands l'Esperance, Curtis & Cheeseman, and Macauley. Remarkable of this trip is the vast extent of deep blue water with a clarity of over 30m visibility. Not much life is found in this barren stretch of ocean. But close to the islands, the water colour changes somewhat, and visibility drops to 30m, which is still excellent. The water is warmer too, and by a noticeable 3-4ºC. A 5mm wetsuit or unisuit is more than adequate. After the sperm whale whaling stopped, the Kermadecs have been avoided by ships, as a potential navigation hazard in an otherwise vacant ocean. But once a year sailing boats leave NZ for the tropical islands of the Tonga group and further, in the months March to May, after the hurricane season, often visiting Raoul for a welcome break. A dive trip is best planned inside this window of time. Being such tiny specks of land in a wide ocean, one would not have expected sea currents there, but the large and slow tide wave, encircling NZ twice daily, hits the Kermadec ridge head-on, causing strong N-S currents, which are unpredictable in their timing. Be aware of this, and keep a good eye on the rhythm of these currents, planning your dives accordingly. Many sharks are encountered during dives, especially during shallow dives. These are most likely Galapagos sharks (Carcharhinus galapagensis), which are inquisitive but harmless.However, watch out when they begin to group together. A small pod of very shy bottlenose dolphins, one of which has its dorsal fin cut off, can be encountered. Underwater photography is benefited by the clarity of the water, but the swell may suspend tiny bubbles from the surface down to 10m, and whirl light pumice sand up from the botom. Holding the camera still, is often a problem. The drag of currents on voluminous cameras could also be a problem. Both the clear water, and being 7 degrees of latitude closer to the sun, make for better light conditions. It may sound superfluous, but please remember that these islands are all protected, both above and under water. This means that no harm must be inflicted on any creatures. Please remember that the Kermadecs are a fragile ecosystem, which can not sustain much interference. Make sure that generations of divers after you will still enjoy meeting the same creatures you saw. Should you have additional dive information, please e-mail me with the facts, such that they can be fitted in with the ones shown here. Also please provide extra information and verification of the sites listed here. Raoul is the main island in the group and has the largest area of shallow underwater habitat. 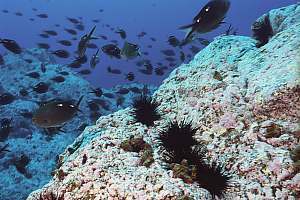 It is also the northernmost island, and for those two reasons, has the most varied underwater life of the Kermadec Group. Raoul itself consists mainly of soft tephra, of compressed scoria, pumice and ash. In many places, the coast erodes so fast that trees do not have enough time to settle. When rocks break off, forming boulders hugging the seashore, they erode even more quickly, providing a source of grey sand for the local beaches. As a result, much of the marine habitat around Raoul is poor. However, the southern and eastern sides expose steep cliffs of hard rock, descending rapidly down to 200-300m. The west and north sides support an extensive shoal of grey sand, interrupted here and there by ancient hard lava flows. The island groups to the NE, are all volcanic left-overs from a time before Raoul was active, and they consist of hard basaltic rock. When sheltered from a SW swell and wind, they provide pleasant and interesting dives. 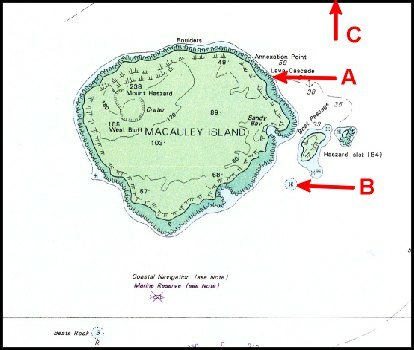 The chart below shows the eastern side of the island and where the more detailed maps are located. Outside the tropical cyclone season, the prevailing winds come from the SW, the heavy swell of which developed over a thousand km of ocean. It bends around Raoul, which is of the right size to do so, and they often pound in on Boat Cove, in the Boat Cove rectangle. Generally the most sheltered diving is found West of Meyer Island. 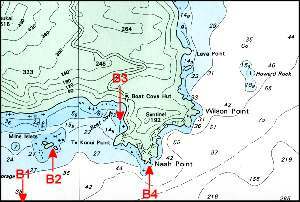 The dive spots will be discussed as they occur on the detailed charts. 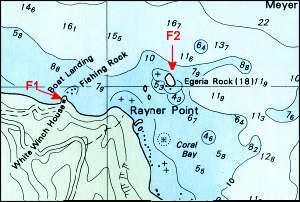 F1: For over a century it has been customary for seafarers visiting these islands, to row their dinghies to Fishing Rock, where one has good access to the island. The custom developed to feed the fishes here, and catch one for the galley. Now the entire area is protected, and so are the gentle giant groupers living here. This is an excellent place to snorkel with the giant groupers at 3-6m depth. Beyond the fringe of rocks, the grey sand extends for miles, and it is good anchoring in 15m depth. Visit the Grouper Photo Gallery for more images. F2: Egeria Rock is possibly also a good spot for snorkelling. 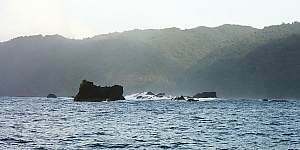 The western side of Meyer Island is usually sheltered, and fortunately provides for excellent diving and snorkelling along its entire coastline. 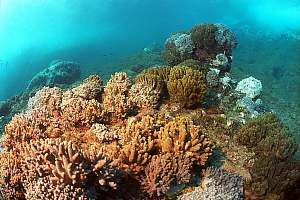 The shore has broken rocks and gullies, which provides for a variety of corals and fishes. Down from 6m, the rocks slope ever more gently down to a bottom of over 20m, where it is good anchoring.Make sure you plan some night dives too! M1: The shallowest part of the island descends to 10m only. It is good snorkelling here. One finds currents in shallow water along the southern point. 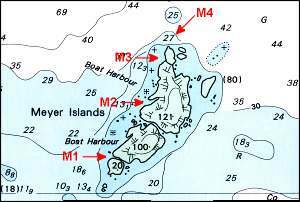 M2: Meyer Island is split in two parts, each with a little 'boat harbour' to go ashore (which is now illegal). These inlets in the rocks provide areas of shelter, and beautiful soft coral gardens. Night diving is fantastic, from the surface down to 20m. M3: This is the deep side of the island, steeply descending to over 20m, but a dinghy can be anchored close to the cliffs on a rocky ledge. Dense schools of demoiselles and blue maomao are found just around the corner, where currents can surprise you. M4: Follow the promontory down to 27m, from one submerged pinnacle to a deeper one, and you will happen upon a beautiful deep cave at 27m depth. 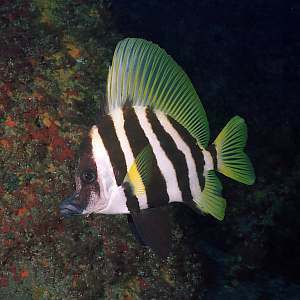 Striped boarfish, giant groupers and other deep reef fishes. The sides and ceilings of this cave clad in a splendid display of colourful gorgonians and filterfeeders. Currents. A composite image of the NW side of Meyer Island offers a most interesting and varied diving experience, also suitable for night diving. The dark shadow on left stands above the deep cove with pelagic fishes. Notice how the yellow lichen and green plant zones on land come down to the water's edge towards the right, indicating more sheltered conditions, excellent for photography and snorkelling. 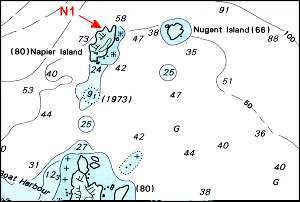 Both Napier and Nugent Islands are placed across the 50m isobath, having steep drop-offs on their outer sides, which are also their sunlit sides. Their sides turned away from the sun (southerly sides) should show colourful gorgonians at relatively shallow depth. N1: A deep dive to 60m (!) brings you in the fascinating gardens of cream and pearly whip corals. This dive should not be attempted without the proper equipment and experience. f214611c: composite image of North Chanter (left) and south Chanter Islands (right). 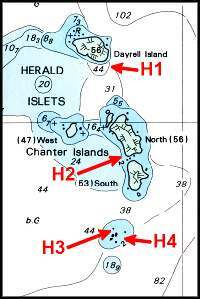 Like Napier Island, the Herald Islets and Chanter are also located on the 50m depth contour, with shallow diving on their western sides and deep diving on their eastern sides. The little arc of islands may sometimes protect against wind and chop from the NE, providing for excellent diving. H1: A deep dive off a shaded wall of Dayrell Island, brings the deep reef habitat closer to the surface. Many small sessile animals are found living on the rock face. Currents. H2: Good diving and snorkelling through the passages. At the boundary of the sand and rock, lives Groppy, a giant grouper, with his six 'bandits', his harem of females. Superb grouper encounters. H3: Broken rock with much fish life. H4: The pinnacle group provides for deep diving on the outside. Boat Cove on Raoul's SE side, provides good shelter and access to the island when waves and weather come in from the NW. It is good anchoring on the flat sandy/gravelly bottom at 17m depth. 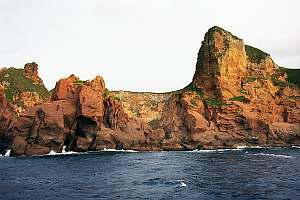 This side of the island is turned away from the sun, and the rock walls miss the characteristic corals of Meyer Island. B1: Outside the map lies Dougall Rock, with deep dropoffs and a deep gully rising to shallow water. At 30m depth beautiful overhangs with gorgonians. B2: Milne Islets provide for good shallow snorkelling. Here lives the grouper Jinx, measuring 1.2m. B3: Boat Cove Landing provides for a good dive in sheltered water. B4: Nash Point juts out in the current and often has schools of pelagic fish. f214614: Milne Islets, seen from the landing, awash in heavy swell. 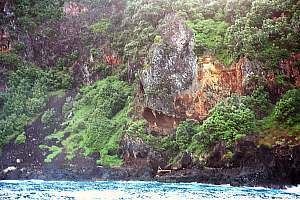 f214615: The landing in Boat Cove is at the foot of tall and steep cliffs. The flying fox from the landing in bottom centre to a hut in top left, no longer works. The cliffs create permanent shade. Diving the western side of Raoul Not many interesting dive spots have been recorded from the western side of Raoul. W1: Red Gull Reef constitutes an unexpected find, a treasure growing on an ancient lava flow, surrounded by boring flats of dull grey sand. 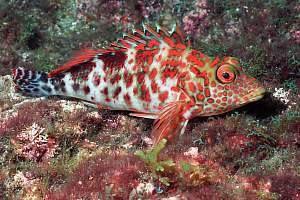 The lava flow has a drop-off, studded with marine life, while fish of many species abound, including large groupers. This spot acts like an oasis on the environment around. Well worth a night dive for those who dare. Tune your GPS to S22º13.820' W177º58.135'. 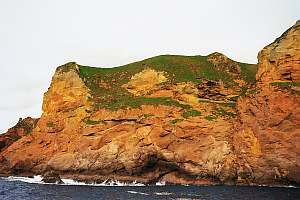 This spot is named after the gull-shaped formation on Raoul, with a dark ravine centred above it. Denham Bay essentially consists of a large sandy flat around a crater. 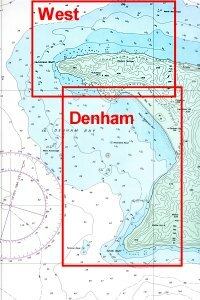 D1: Wolverine Rock is a navigation hazard at high tide, and may be difficult to find. Once protruding high above the water, it has shrunk to what it is now. 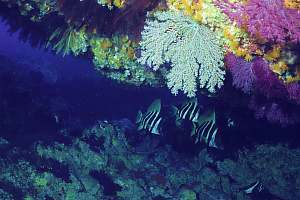 One finds corals and pelagic fish. 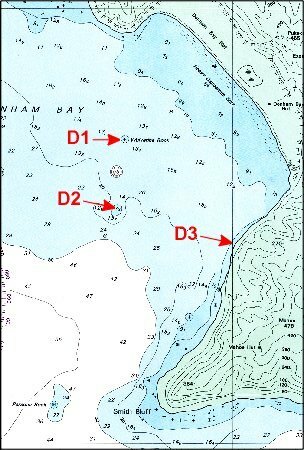 D2: Stingray Shoal: a shoal rising several metres above its surroundings has been reported as the mating ground for short-tailed stingrays. D3: here one finds a reasonably steep coast hugging Raoul, while descending to 15m. It allows one to study the sublittoral zoning around the island. Macauley is a large undersea volcano with a very flat top(far beyond diving depth), of which Macauley Island protrudes out of the water. The top of this island looks flat and rounded from all sides, but a crater is found near its highest point, Mt Haszard. Although initially a stratovolcano (layered with soft material), the top has been formed from slow lava flows as a shield volcano. A: Interesting pockets of life on and around an old lava flow, located near a good anchoring site. B: The best choice, offering a varied dive to 20m depth. 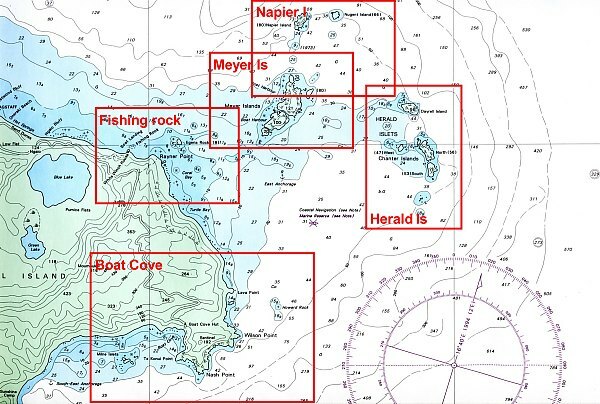 C: Off the map is Macdonalds Rock (or shoal), a large area formed from hard basalt. Two pinnacles rise to the surface, constituting a navigation hazard. A dive around these pinnacles is interesting, but the whole shoal, about 15-20m deep, is barren and covered in sea urchins. f214716: Macauley Island seen from the NE. The high point on right, is Mt Haszard. On left Haszard Islet and its 'dog' further left. Access to the island is possible only in the middle of the picture, at the lowest point of the vegetation band, over a finger of hardened lava (now illegal). The island was once covered in lush native forest, which was completely eradicated by the grazing of goats, released here at the end of the 19th century. Their work was so complete, that no regrowth has happened since. The green vegetation consists of a thick mat of grass, the seeds of which feed the numerous red-capped parakeets living here. Curtis is a very wide submarine volcano, rising from a 500m deep sea floor on the Kermadic Ridge. It is still very active, being monitored continually. The main crater lies to the East of the island, still today a deep spot of 317m in surrounding flats of no deeper than 50m. The rocks around Curtis have been spewed out by the crater (tephra), forming soft rock all around the island. These rocks are poorly covered in marine life. 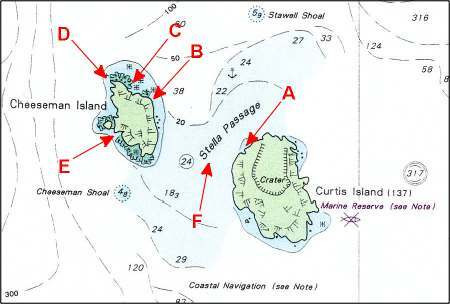 By contrast, neighbouring Cheeseman Island consists of much harder material, around which pinnacles and rock platforms (the grey coloured frills around the island on the chart). Most dive sites are found in this area. Good anchoring is found by the anchor symbol, where the bottom consists of loose grey sand. Anchoring is also possible in the entire Stella Passage, where the bottom consists of mixed gravel and sand. B: Overhanging cliffs with gorgonians. C: Home of a number of groupers. D: Steep drop-offs from the submerged pinnacle. E: An area suitable for good snorkelling. Shallow and interesting, but often exposed. F: The stella passage is boring for divers, and subject to strong currents. f214717: Curtis (left) and Cheeseman (right) seen from the north. In between the Stella Passage. Curtis has a flat crater rim, but facing the photographer this rim is breached, and one can see straight into the back of the crater. Notice the difference in rock formation between the two. Cheeseman on right, has the harder rock, and provides better attachment for sessile marine creatures, and is thus more interesting to divers. f214721: A close-up view of Curtis Island, and over the cliffs in the foreground into the still active crater. Notice that these tephra rocks are rather soft. f214718: Close-up of the rocks of Curtis, seen from the Stella Channel. Some blue-faced boobies nest here. In the foreground the pinnacle where the giant grouper Mr G can be found. l'Esperance Rock is a very small pinnacle, formed of hard basalt, rising steeply from a 100m deep bottom. It acts like a Fish Aggregation Device (FAD), attracting pelagic species. Many divers have reported this as their most spectacular dive, but in the past five years, fish life appears to have diminished considerably. Among the pelagics found here, are grey nurse sharks and bronze whaler sharks. 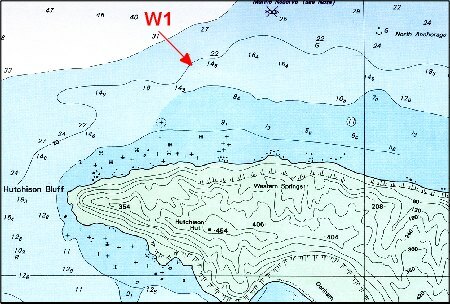 Due to large swell, curving all around the rock, diving is not always possible. Anchoring is a problem too.